Message Boards - Boba Fett Fan Club → General → Which armor is cooler? ESB or ROTJ? Topic: Which armor is cooler? ESB or ROTJ? im goin with esb because i like all the green and the gauntlets and jet pack color scheme....ahh heck i just love the esb armor its just freikin SWEEET!!!! Re: Which armor is cooler? ESB or ROTJ? Seeing that I just LOVE Mandalorian armor, I like them both but the color is more saturated in the ESB so I vote for ESB. Not that I have the right pictures or know how, but I think a side by side comparison would be cool. costume. Age. Movie title. Amount of lines. Total screen time....Shall I continue? I thought we were just comparing armor. *shhhhhh. * I like jango's from AotC best. Lives throgh the end. "dies" . Sneak attacked. Gets hired. Already hired. Says "hes worth alot to me" Dosnt say "he's worth alot to me. Shall I continue? What is this? Mando'ade eye for the Aruetiise guy? 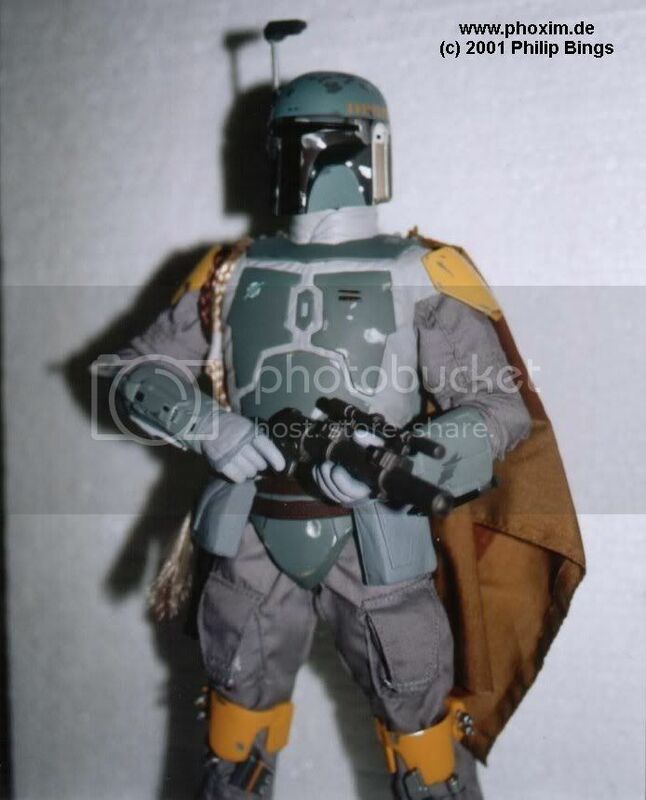 I think I like the solid colored jet pack from ESB, but I like the red/rust colored gauntlets from Jedi. Kind of goes with the red on his t-visor. Stands out better. Although, Jaster Mereel's color scheme, looks better than that. Pretty much the same as Jedi Fett color scheme, but with red shoulder bells (to match the gauntlets and visor), instead of orangish/yellow. Not a big fan of the yelllow color on the armor. Devin, that looks like a model, vs. the actual costume. And how about a similar image of the ROTJ armor for us to draw a fair judgment after comparison? Good question. Let's hope this topic can find out for us. And then be better grounds for deciding "coolness." I like the ROTJ color scheme better myself. None look bad - and the ESB version seems to match better. But I still say ROTJ. It's a tossup for my. ESB one looks more uniform and efficient, and looks more, well, uniformly coloured (repeating my previous point). However, the ROTJ scheme looks more mercenary-ish, as if it's been accumulated over the years, or as if it had to be replaced or something like that. It makes it look like he's had to improvise and adjust more. And with all of that said and done, I say I like them both about equally, although with a slight preference to the ESB armour. The battle-worn look is cool, but I think the ESB one looks good with its uniform design. However, having known the ROTJ one more, I'm inclined to change my previous answer, and say ROTJ...Man, I'm a flipflopper. Okay, so long as it's Fett, it's good. Okay, so long as it's Fett, it's good.